Making a Costume is a Learning Experience! Whether we observe Halloween or prefer a Harvest Celebration, costumes are often on our minds in October. Part of that reason is because whether it’s a store-bought costume, or one that is sewn, we’re bombarded with ads that say “pick me”! There’s a third choice that we don’t often hear about because no one makes money on it, and that would be a costume that the child makes. If your child decides he/she wants to make his own costume, it can be quite a learning experience! Kids learn all the time, whether we are teaching formal lessons or not. And sometimes they teach us. When my son was 5, he announced that he would be making his Halloween costume that year. 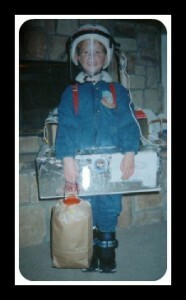 It was summer at the time, and he had decided that he would be an astronaut for Halloween. I’ll admit I was a bit amused that he was planning so far ahead, but I went along with it. He didn’t want to buy a costume, and he didn’t want me to make one. He was very clear that he was going to make it by himself. First he researched what an astronaut would need by pulling out his visual dictionaries and other books so that he could study pictures of astronauts. Then he started gathering what he needed to create the ideal costume that he envisioned. It wasn’t play, although it would have looked like that to an adult who didn’t understand children. He was earnestly working! He was immersed in his planning for months, and it was very real to him because had a wonderful imagination and he believed in himself (that’s common for homeschooled kids). Each item on his costume (front and back) had a purpose, which he described in detail to anyone willing to listen. He was beaming on Halloween, but not just because it was Halloween. He’d set a goal for himself and had achieved it. As I watched it all unfold, I realized what a learning experience this had been. Not all kids will want to make a costume, but if your child does, encourage him but resist the temptation to help unless asked. Of course it’s not going to be as professional looking as what adults could do, but this is an opportunity for it to be all about the learning experience and feeling a personal pride. It may not win any awards for being the best, but in his/her heart (and yours) it will be. And, because our kids don’t go to school, there’s no one to make fun of their imagination. It’s been years since my son made his first costume, and this photo is still one of my favorites because I remember his joy. And that’s priceless. Written by Karen Taylor, posted on 14 October 2012 at 11:30 am, and filed under Homeschooling, Learning Ideas. Bookmark the permalink.